Houston-based family business experiences rapid growth. Are they coming to a neighborhood near you? As parents of three children we experienced the need for a good infrastructure in water education that reaches the children and their parents. Today, Pengu Swim School, a family-owned business that believes firmly in the importance of teaching kids about water safety and helping them become confident swimmers is announcing a new location opening in Sugarland, Texas. This newly constructed 8000 square foot indoor pool facility will be in the master planned community Riverstone at the intersection of South University Blvd and LJ Parkway. To grow this business, Pengu Swim School designed and executed the following facility plan. First of all, they started with a separate climate controlled viewing gallery for parents. Next, they developed State of the art water purification system. Followed by humidity control in the pool area with a water temperature of approximately 90 degrees. There is a kid-friendly sailing Beach theme décor. A snack bar is offering healthy snacks, “goodies,” and a variety of drinks for busy parents on the go. Individual changing rooms with diaper changing stations. Dedicated play area for siblings and students to use while they wait. Blow dryer station for after lessons, so the kids do not need to walk out with a wet head of hair. The all-important swimsuit dryer. “PENGU store” offering a variety of goggles, swimsuits and aquatic toys. Free WiFi to all the parents who need to keep up while their children enjoy swimming lessons. 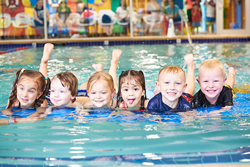 About Pengu Swim School: Pengu Swim School is a state of the art indoor aquatic facility serving children from the age of 4 months and up based in Houston, Texas. Pengu offers perpetual year-round lessons at a price of $78.00 per month. Year round lessons mean that students don’t sign up for single sessions, but continue to come weekly on a month-to-month basis, with an option to cancel with a 30-day notice at any time.